want a career that rewards hard work with flexibility, a good salary and an achievable bonus? Revive! has the UK’s largest network of IMI accredited mobile SMART repairers. 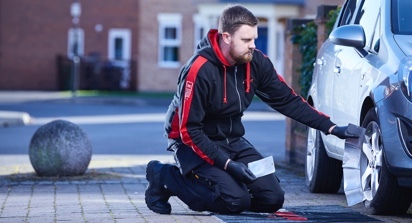 Our technicians carry out high quality bodywork repairs from start-to-finish on small areas of vehicle damage and all repairs are carried out a location convenient to our customers. With an increasing customer base that spans retail, insurance providers and national franchise dealers, we’re growing fast! We’re a friendly bunch too and have a great head office team that is always there to offer support, wherever you are. Whether you’re looking for a new career, you’re an experienced SMART repair technician or currently working in a bodyshop as a trained resprayer, prepper or panel beater, we’re always on the lookout for ambitious people to join our nationwide network of mobile repair technicians. so, why work anywhere else? Technical excellence is a core value here at Revive! and our training team are true masters of their trade. With decades of experience they’re the perfect people to deliver the very best training in the industry. If you’re endeavouring on a new career, you’ll go through a thorough training programme as you learn SMART repair the Revive! way. From diamond cut wheels to minor dents we have specially developed courses to make sure you can handle whatever a job throws at you! On top of that, our industry-leading training centre is certified by the Institute of the Motor Industry (IMI) which means you use your training to gain a professional ATA accreditation in SMART repair. Even if you’re experienced and already have your accreditation, we’ll continue to develop your skills and offer a refresher every 3 years, so you know you’re always on top of your game. You’ll be provided with a Revive! branded van and have a phone and tablet to keep you in contact when you’re out on the road. Vans are fitted out to a very high standard to reflect our high quality image and provide a great ‘first impression’ with business and retail customers alike. We do not skimp on our equipment and only use the best quality products using brands such as Sikkens, 3M and Devilbiss. 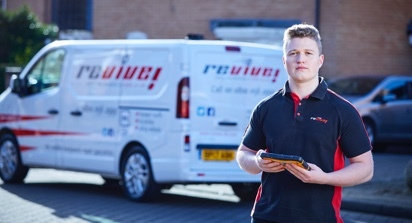 All jobs are delivered and scheduled via the Revive! app on a tablet so there is no end of day paperwork to complete! Revive! seek ambitious individuals, from all working backgrounds. Whether you’re currently working in a bodyshop and tired on the production line or looking for a new career in SMART repair, experience is not necessarily required in this industry! With our unequalled, fully certified training we provide you with an unsurpassed standard of skills and knowledge, which in turn will ensure you have every opportunity of achieving your potential as well as earning a good income with strong bonus potential. Revive! is a fast-growing company with lots of ambition to continue to build on our great position in the SMART repair market which brings fantastic opportunities to technicians and other staff too. Revive! run an ongoing accreditation programme with the Institute of the Motor Industry (IMI) for our technicians to ensure that the professional standards of quality repair and customer service are met. Revive! also work with the highest quality products to allow for a durable finish offering a ‘lifetime ownership guarantee’ to our retail customers to give peace of mind. Our superb training programmes offer you the opportunity to build your technical skill levels and gain an externally recognised qualification and keep your accreditation up to date in accordance with the IMI requirements. Why apply for a job at Revive? learn more about working with Revive!